Are you sure that 1998 QE2 was traveling with its own moon and was not bumping into a comet which would say goodbye to it soon? Buck Rogers remember me man? i love you! Yeah! Finally, some sane people making sane comments! Awesome! And, Awesome! for for this celestial event. How about putting a camera and radio transmitter on these things. Thanks for the comments! Science.com is now saying this will be coming far closer to Earth than once thought. Shouldn't be dangerous but will make for an interesting nighttime view as it passes close to our Southern Hemisphere. 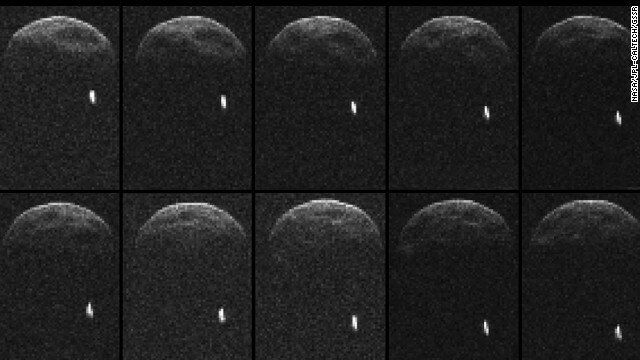 Instead of sending people to Mars via Mars One, why don't they make an attempt to go to this asteroid? Once landing on the asteroid, it could then be used for space travel and space exploration. It's moving at high rate of speed. Would be a self propelled mode of space travel. Brilliant idea... Everytime a comet passed we could hitch a ride, and then propel ourselves out from it, when it got to a point that we wanted to travel to. We could over time, on the ones that pass by often build bases on them, couldn't we? Comets have very long orbital periods. Also, a lot of them are not in the plane of the ecliptic, which is where all the planets (well, except for Pluto) are. Might be good for an outbound trip to say the Oort cloud, sit for a while, and catch it again on the next inbound leg. However it would be great to say mine them for ice and other volatiles while they're in the region of the inner planets. It's actually been proposed. The facility would have to be self-sustaining, and underground to protect it from radiation. The methods for doing this would be (would have been) worked out on the Moon and hopefully tested for a few years before putting a human settlement on something that would be completely out of touch for months or years at a stretch. It's also exactly what we would need for asteroid mining. It's also been proposed to develop a method of propulsion that would change the orbit of an asteroid or similar body, probably minutely over a course of years. This would let us put the asteroid at a LaGrangian point, or into a nice Hohmann ellipse for interplanetary transits. With sufficient development, this same facility could conceivably make fuel, refine metals, and surplus oxygen and water to make it a way station for craft heading to many destinations. So, here's hoping that we find oil or terrorists in asteroids to make this a national priority.